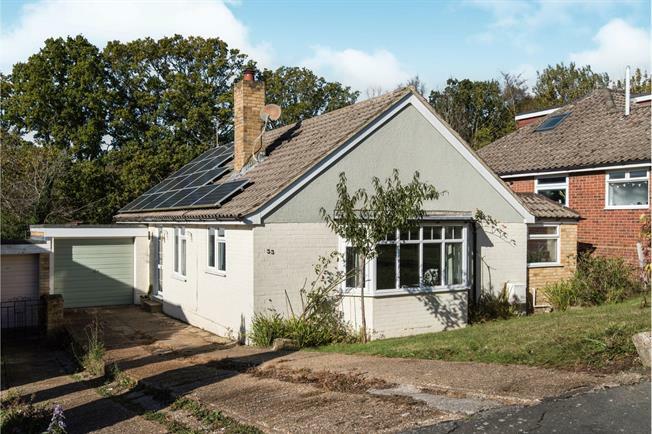 3 Bedroom Detached Bungalow For Sale in Heathfield for Asking Price £325,000. A bright and spacious three bedroom extended bungalow, benefitting from a private driveway, garage and a generous garden. Internally, this wonderful property hosts particularly spacious accommodation; featuring a contemporary kitchen/dining room with roof light windows as well as glazing to the front and rear, a generous lounge, again with double aspect glazing and a feature fireplace, a contemporary bathroom which includes a separate shower cubicle as well as a bath and three well presented bedrooms. To the front of the property there is an area of lawn next to a private driveway, in front of a detached garage. The generous rear garden is mainly laid to lawn but also features a large area of raised decking, level with the ground floor of the property.